The Galactics arrived with their battle fleet in 2052. Rather than being exterminated under a barrage of hell burners, Earth joined a vast empire that spanned the Milky Way. Our only worthwhile trade goods are our infamous mercenary legions, elite troops we sell to the highest alien bidder. In the fourth book of the series, James McGill is up for promotion. Not everyone is happy about that, and McGill must prove he's worth his stripes. Deployed to a strange, alien planet outside the boundaries of the Galactic Empire, he's caught up in warfare and political intrigue. Earth expands, the Cephalopod Kingdom launches ships to stop us, and a grand conspiracy emerges among the upper ranks of the Hegemony military. In Machine World McGill faces an entirely new kind of alien life, Galactic prosecution, and thousands of relentless squid troopers. He lives and dies in the falling ashes of the empire, a man of unique honor at the dawn of humanity's resurgence. 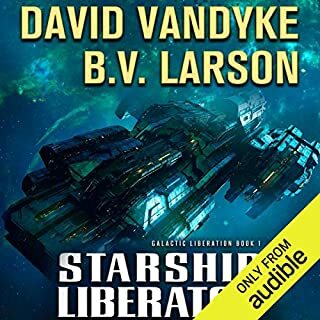 ©2015 B. V. Larson (P)2015 Audible Inc.
At the end of the previous book in this series “Tech world,” we learned that the Cephalopods, or “Squids,” are on the move and the once seemingly all powerful Galactics are nervous. James McGill has been nominated for a promotion, and Imperator Turov has to go on with life looking twenty years younger. Now, in “Machine World,” the latest book in the continuing saga of the “Undying Mercenaries,” McGill starts off the way he always does by taking matters into his own hand at the risk of the entire human species and the chagrin of his commanding officers; but if you’ve been keeping up on the series know that his moves often save the day. If you liked the previous three books than you should like this one; if you haven’t read any of the series don’t start here, you should read them in order. A word about the narrator; since these books are written in first person Mark Boyett is James McGill taking on his persona and bringing the story to life. I don’t know If I would give the story five stars without his influence, he really does a great job. By now, in book 4 of the series, you well know the routine of James McGill- they way he handles authority, his code of honor and ethics, and his love life. If your still reading the series, then this is all appealing to you. In my opinion, this book is a fine addition to the series. James, despite the suspension of belief you have to invest in his schemes always working out (to varying degrees) in his favor, is a character I just can't help but like on some level. He is honest, upfront, occasionally brutal and, admittedly, a bit thick at times; but he's got his heart in the right place. He takes things into his own hands and gets things done, and it's just fun to read about his exploits. This is no great literary work, but it is enjoyable, much like any good episode of "Star Trek". It gets silly or ridiculous at times, but if you can go along with the ride, it does wind up placing a smile on your face as you listen- and you keep listening to hear about how he's going to get everyone out of the next mess. The severe review I gave of the previous book (Tech World) was mostly due to the fact that I felt the author let James "get out of character" during the story and the result was a lot of (relatively innocent) alien deaths. While he wasn't exactly personally responsible, he was involved enough where it didn't feel true to the character I had been reading about up to that point. But in this book, things seem to get back on track. Oh, James still plays galactic dice and shoots from the hip A LOT, but his ethics and code of honor seems reinforced in this book. He still does a few shady things, but most of it I can, as a reader, at least understand his reasoning and go along with it for the sake of the story. I may not agree with everything, but like I've said already, it's an enjoyable read. Of course, Mark Boyett does a fantastic reading performance. 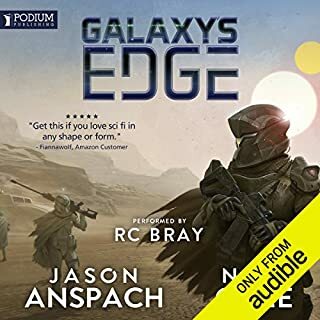 It's so easy to forget that you are listening to a single person- each character come alive with their own with with unique voice, cadence, accent and personality expressed by Boyett. When i have to remind myself this is all coming from one person, it really is quite astounding. I had hoped for some development, but its always "same old McGill" in this one. I feel half the lines from other characters about McGill have been heard in previous books. He goes nowhere, and he learns nothing. Nome of the other do either. Its a good time killer, but made me not want to buy the next one..
No problem, I've got a plan. "My mother always told me the best policy was honesty, but I never believed her." This book really has McGill's personality down pat. He is a scoundrel, a cad, a conniver, a rogue, but he is honest unless it will hurt someone. He is morally grounded even when it hurts himself, and benefits truly bad guys. That's what makes him so likable. He opens his mouth when he shouldn't and gets himself in big trouble, but not only himself, he usually takes the entire human race to the edge of annihilation, If not that, then just his squad or his ship. But he does always come up with a plan. Probably not very probable, but entertaining. If you live and keep winning, or sort of winning, battles, it will seem you are unbelievably lucky, but this is fiction, and some warriors do go home in real life. The whole premise of this series is the ability to regrow humans after they have died. The computer keeps a DNA recipe, and a backup of everyone's brains--their personalities, abilities, memories. You die in battle and the bios toss some raw material into a revival pod and regrow you a new uninjured body, and program your brain into it, all in just about 4 hours. So you can go fight and die again. There is some reflection on this type of life and how it affects your actions and outlook. Earth is a vassal state to the Empire, so its soldiers do the Empire's fighting. There is some indication that all is not well in the huge Empire, and some of the colonized or enslaved worlds are trying to take advantage of that. There is a lot of politics in this book, and some underhanded dealing, but that is probably what would really go on. There is great technology in this series. The battles are engaging. The characters are well-rounded, and individual. Each book takes place on a different planet in a different system with a different type of enemy. Each planet is unique, posing unique challenges requiring new solutions. James McGill is the main character, so he can't get "permed" (permanently dead, not regrown) or the series ends, so of course he is impossibly lucky. But then people still flock to see James Bond and don't complain that he couldn't be that lucky. Mark Boyett is amazing. He does McGill's country boy cocky attitude perfectly, but then can also do a Japanese accent, a Russian accent, aliens' accents, and the superior officers' voices (I especially like Graves), and women. They are all different, believable and well-maintained. He does the inflections correctly, drawing out the humor perfectly. Very few females have reviewed this book. It should be generally considered a "guy book", but I happen to love action movies and don't mind being one of the few women in the movie theater when I go with my sons. I loved the other books and this one as well. I can't wait to see the Empire overthrown, and Earth start advancing in the universe. The more BV Larson books I listen to the more the characters of Kyle Riggs and McGill seem to be the same person. The big difference between the two is that while Riggs is the leader who uses his mind to manipulate and triumph over his enemies, McGill is stuck as a low man on the totem pole who continually has to fool, and handle his superiors and friends . Unfortunately, this formula becomes harder to believe with each new book. How many times would a superior officer allow a man to lie, be caught out in part of the lie, and remain an active member of the unit? The action in the story is good but not as engrossing as it was in his previous books. The story is entertaining but hard to believe. At one point in the story an antagonist is thwarted and pops out of the system in a ship and returns the next day with resources and supplies that apparently were just hanging around if his first plan failed. Mark Boyett does a good job of narration. His character voices allow the listener to easily determine who is who. He emotes scenes well enough to keep your interest in a story that is not totally coming together. The first couple of books in this series were interesting, and moved along well. By the third book, I stopped liking the main character as much. He seemed smug and impossibly lucky. By the 4th book, the author clearly just doesn't care anymore. His story line contradicts itself. The plot dies off half way through the book, and he starts into another plot that makes zero sense. I hate it when a good concept dies like this. When the author is repeating himself and just leaving things out instead of dealing with them (specifically, in one scene, two Officers die, and their bodies are not mentioned in the cover up effort the protagonist has to preform to save mankind) ... This is probably the worst book I've read in 10 years. Don't get the first book, even though it's OK...because eventually you'll be reading this piece of garbage. blech. I do like the narrator, though. My big complaint is that it ended too soon. It's not a perfect book and maybe not even the best in the series, but I still have to give it 5/5. in the end, it was a story I dint want to put down. McGill... James McGill! More action and backtalk! If you could sum up Machine World in three words, what would they be? Everything. The action was great. I mean from the fights, let me stress all sorts of fights, to physical brawls, some minor mech warfare, and the same typical character clashes that makes this ongoing series so good. Then you had military drama, back stabbing, alien cockiness, and great old fashion scientific exploration. It has it all. I loved every moment of it. It made me excited. It made me angry. It had me wondering if doom had came. It had me upset it was over. I loved every second of it. So many to chose from. Its a cross between McGill's ability to get in and out of trouble. A cross between the side deals, his so many relationships, and all of the action. What separates this from so many other stories is that there are simply so many moments that can be considered a favorite. I'd have to say my most liked, without ruining it for anyone, was when he was nearly out of all options, and desperation along with luck helped his fate. The sheer fact that things get so hopeless down to the point in which you are checking to see if you are nearing a cliffhanger ending or a sharp end to the series is what makes so many moments so fun and hence favorites. I really enjoyed this story. It was a continuation of the ongoing series and a well done one at that. It fleshed out Carlos a bit more and touched on a few other details. Its a great story about a main character that isn't really a hero but is one, even if not very many others will admit it. What really makes this story so good is that McGill is clearly a top of the line, warrior. But he is always a very quick thinker with a lot of luck. Sure hes no college educated tactician or some military raised seasoned brat. He gets his wits from the guts and grabs your emotions and takes you right along for those tough moments. Those hard decisions and knowing immediate results. It doesn't always work in his favor but its a very nice mix that makes the overall outcomes that much more fun. This series is, for me, now an old friend. McGill is a known quantity. He will always act on his gut instinct, which has proven very effective in keeping him from getting permed—really dead. While remaining consistently insubordinate and acting as the loosest of cannons, he manages not only to save his own skin, but time and again pulls humanity’s chestnuts out of the fire. The world of the Galactics that McGill has been forced to play in would seem to be aligned against him and his entire race, but someone is surely looking out for him, because his improvisational skills, which at first seem to result in horrible mistakes, end up in being just the thing to help McGill slip out of harm’s way, and end up getting mankind out of trouble, and earning McGill a promotion. I really enjoy the dialog that B.V. Larson has written, and Mark Boyett delivers it with style and aplomb. The circumstances are outlandish, need I say otherworldly? But what would you expect from a first-rate Space Opera? This is great entertainment. Along with Marko Kloos’ Frontline series, and Larry Correia’s Grimnoir Chroncles, I would use it in a court of law to make the case that audiobooks are more entertaining and engaging than any blockbuster on the silver screen. Fantastic 4th book the undying story could almost be set in Ancient Rome with its scheming, wheeling and dealing. 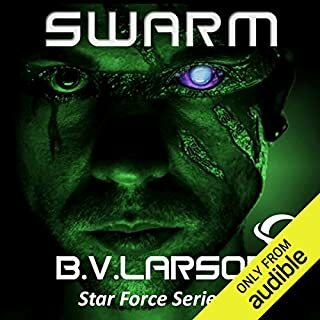 Once more B V Larson delivers the goods in this fourth book in the Undying mercenaries series. I did wonder if he would be able to remain consistent in terms of quality of the story but was not disappointed. I can appreciate that after writing three previous books which were all excellent that it would be increasingly hard to come up with a continuing story that would satisfy the high standards already set thus far. 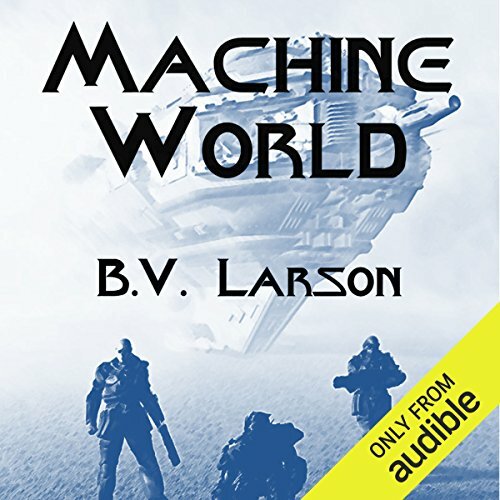 Larson succeeds in this difficult task in the shape of Machine World and a new and hostile alien world is vividly wrought in the pages of this engrossing story. Larson treats the reader further and brings back plot elements from the previous book, Tech World and unleashes them upon legion Varus. I like it when authors think ahead and weave characters, races and story elements together and uses them to great effect as the series of books progresses. As ever in this great series the combat and even the training is brutal and unforgiving. I do still have to wonder at the mentality of those who can engage in training or evaluation sessions with their close colleagues and kill them viciously and then go on as if nothing has happened the following day. it does seem to me that all the repeated experiences of death would destroy a persons mind but our battle hardened legionnaires seem to be able to shake this off time after time. Another oddity in the series is the lack up to this point of any infantry support via some form of cavalry in the shape of mechanised armoured support. It would appear that the military brass has stumbled across a well known sound military tactic in having troops supported in such a way as if it's a new idea. it does also seem rather strange that no close air support ever seems to be used to assist in a ground war of the magnitudes evident in the surface combat seen in this story. The above observations would be my only real question mark over the nature of the stories seen in this series but despite these it still doesn't detract from the enjoyment of them. 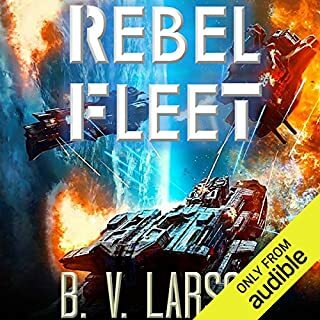 Yet again Larson packs plenty of story into this book not wasting words on anything superfluous to the narrative and so keeps things moving and relevant and as such machine World is yet another page turner in the Undying Mercenaries series. Some other authors would probably have this book split into two related books in a series but not Larson. His writing style is never wasteful in any regard and we are moved through the narrative efficiently which has held my interest non-stop from first to last page. I could go into more plot detail to give those who have not read any of this series a hint at the sort of story to expect but I think that anyone reading a review of the fourth book in the series is more than likely to pick up the first in the series, Steel World and so by now will have a good idea of what to expect and so I shall not ruin your enjoyment of this excellent story by possible spoiler information. Suffice to say that our hapless hero, James McGill manages to end up in all sorts of trouble both on and off the battlefield and so what I will say is that I rate this another top marks effort from Larson and worthy of the series and what you might have come to expect from this excellent and entertaining saga. 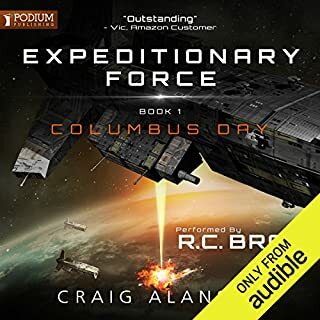 Mark Boyett once more does an excellent job of the narration and having listened to all the books in this series thus far have come to realize that his rendering of James McGill reminds me somewhat of Denzel Washington's voice and accent. I wonder if others will hear this or perhaps it's just me! Rarely have I come across a series of stories I found so addictive and enthralling and full credit to Larson's writing abilities for maintaining such a high standard of work. Right, now off to download the next book in the series, Death World. Another Great Story with a Great Narrator. in the series Undying Mercenaries Another great story from BV Larson. complimented by a incredibly flexible narrator Mark Boyett. this man makes audio stories come to life. I will have to find more audio books narrated by this person. what happend after steel world??? the stories keep getting meh! i mean the first book of the series was epic, real epic. i couldn't stop all the way till the end. 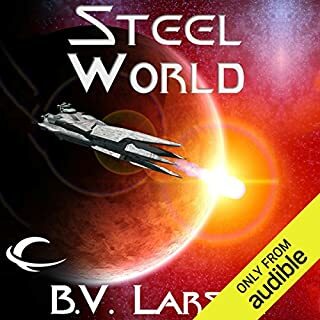 the following books simply felt uninspired and underdeveloped when compared to the authors other works, including steel world which again was an epic and engaging first part to the undying mercinaries series. Bit of a stretch this time. Probably one of the weaker entries into the series. The stunts the main character pulled off in this one are too far fetched to have worked. But, i still enjoyed it enough to push onto the final book soon.